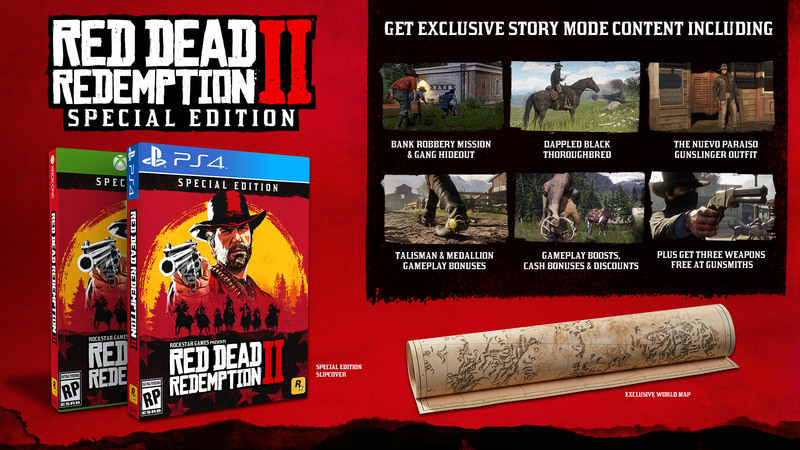 Red Dead Redemption 2 is the only new game I’m planning on purchasing this year, and while it’s not necessarily the first time that game editions other than “standard” have peaked my interest, it is the first time that I’ve seriously considering pre-ordering something other than the “standard” edition. It’s curious to me because I’m not exactly sure what’s driving that impulse. So I ask: what makes you want to upgrade? I’ve long been pretty old-school about purchasing games, and after a couple recent burns, I’m not much keen on pre-ordering games at the moment. For a while now, even though I’ve been excited to play RDR2, I’ve pretty much thought that I’d avoid a day-one purchase and wait to see just what the game offers. (I don’t even know if I’ll have time to play it until some sort of holiday break, anyway, which won’t happen at the games October 26th release.) I’ve never cared much for DLC, and in the rare cases that it has mattered, I’ve just waited for game of the year editions. In the end, some developers publically release all those “special” things in the special editions eventually, so I don’t mind following the old adage “the best things come to those who wait” when it comes to the games I want to buy. Maybe something more personal is motivating this whim? I mean, I like my money, and I like to spend it wisely. Deep down I know that regular ol’ RDR2 will make me happy as happy can be and that twenty extra dollars could be saved for something more meaningful than intangible “gameplay bonuses.” But I’ve developed an intrinsic connection to the original Red Dead Redemption, one that’s rooted itself in my psyche to the point that, well…I hate to admit it, but I think I might have a case of RDR2 FOMO – fear of missing out. If I never knew that there could be something more to RDR2 than what’s in the regular game, I’d be none the wiser. Now that I know, it actually bothers me a little to not consider taking the extra plunge. 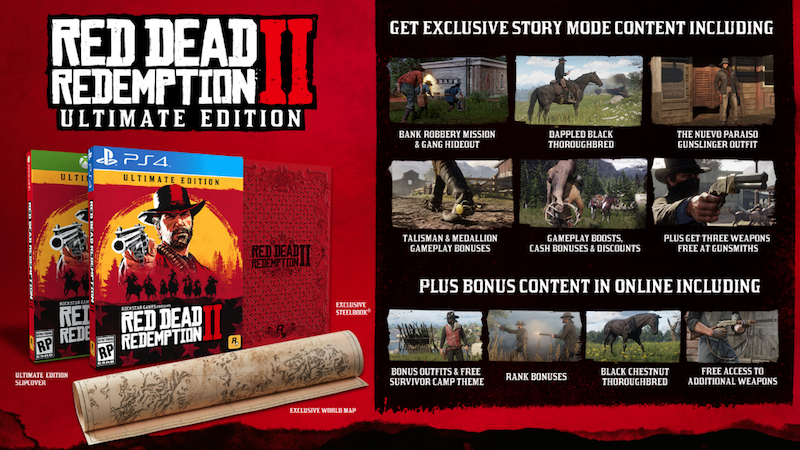 Lest I forget, muddying the waters further is that there are not only pre-order bonuses, but pre-order bonuses that seem to vary depending on if you get the game physically or digitally. And, at least in the case of one bonus, you have to pre-order by the end of this month to get it. Besides the point may be that because they’re offering so much stuff in different pre-order bundles, it’s a little hard to keep track of what you’re getting! It’s an interesting “problem” to have. I realize that there are a bazillion bigger problems in the world today, but in my safe little gaming bubble, this one currently weighs most heavily. I want Red Dead Redemption 2 to be a special experience, but it’s possible that my own brain is turning that into something it can never be. 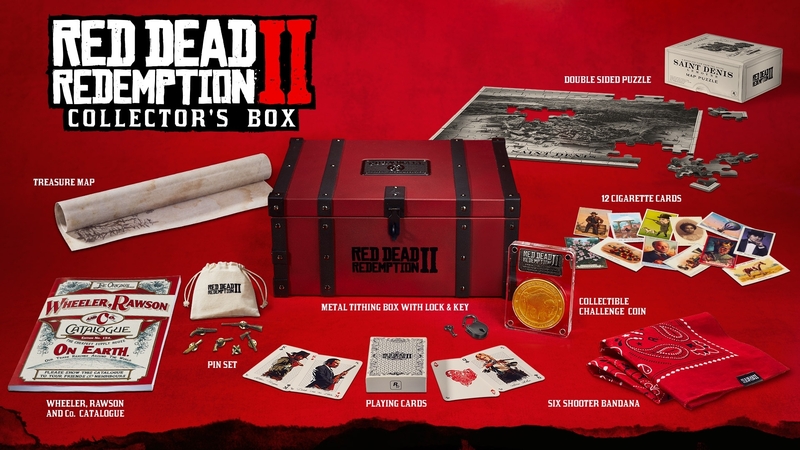 Can you convince me that it really is worth it to upgrade to Red Dead Redemption 2 special edition, or can you assure me that the standard edition will be just peachy? What is it about extra-special gaming editions that makes you want to buy them? Is it simply a matter of wanting “all the stuff” or something more? I used to love buying special editions that gave me special steelbook game cases and extra things like artbooks and lore stuff. I’d even be tempted by stuff like the Mirror’s Edge messenger bag. However, a couple of things happened. First, I stopped pre-ordering games. I can’t remember the last time a store didn’t have enough copies of a game I’d wanted on day one, and the in-game bonuses were never enough to affect the experience as far as I was concerned. As for special editions with physical goodies, I realized that I never did much with them. I’d look at them a few times, think “this is cool,” and then basically forget about them. These days it’s just standard editions or sales for me, which I guess is good for my wallet. Still, I kinda wish I could still muster enough passion for a game to really enjoy those extra goodies you see in special editions. I think one *really* has to be into collecting to get a super-special edition of a game (or a set of collectibles with no game). But even then… Well, I’m not one to judge, but I do know that from my wallet’s standpoint, like you, I’d much rather focus standard editions or just waiting until a game goes on sale. Though I have to admit that with RDR2, I’m still thinking about upgrading. But to each his own, y’know? At the very least, having the choice is nice. When it comes to the games we love, what’s the driving force behind getting special or collector’s editions of them? Is it simply that we want to show our love by spending more money? Is it a fear of missing out on something that will give one an edge up? Is it all that and more? Taking cues from the recent announcement of Red Dead Redemption 2 game upgrades, this I recently pondered on Virtual Bastion. I find I tend not to bother with these kinds of special editions. The way I see it, a game is only as strong as its main campaign, so if it needs all of this supplementary material just to be good, chances are it’s not a worthwhile experience. Some of these things are admittedly pretty neat, but not something I would fork an extra twenty dollars over. Also, pre-ordering games made sense back in the nineties and 2000s when the only way to obtain games was by purchasing a physical copy. Back then, stores running out of copies was a legitimate issue. Digital distribution allowing people to get games from home translates to fewer people buying physical copies, meaning acquiring a game is no longer a concern – in some cases, you don’t even have to worry about getting the limited/special editions right away. Your point about sticking to the $60 game is well taken. If the core game isn’t very good to begin with, a few extra bits and pieces aren’t going to change that. (And, if anything, they may show what the game is lacking.) The “added value” factor really only goes as far as the individual player, too. All too often, when I get a “special thing” in a game, I’m so paranoid about loosing it in some manner, than I never use it. I might as well just put my extra $20 in a closet…only to peek at it every now and then just to feel relief that it’s still there?